At birth, our babies are born with a brain one-quarter the size of our adult brains. In the first year of life, our brains nearly double in size. By the time we are three, our brain has tripled in size. Critical brain growth happens in the first moments, the first days, weeks and months of life. Knowing we are growing a brain places a lot of pressure on new moms. 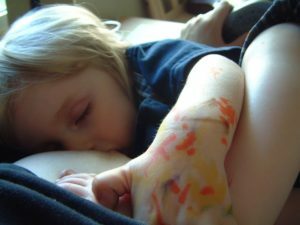 Lactation consultants, nurses, doctors, midwives, and doulas did not hear from breastfeeding experts at the Alberta Breastfeeding Committee’s annual conference, held concurrently in Edmonton and Calgary in September 2012. They heard from brain scientists. The “Breastfeeding and the Brain” conference featured Dr. Robbin Gibb, assistant professor in the Department of Neuroscience at the University of Lethbridge, who talked about research into parental influences on child brain development. And, renowned child psychiatrist Dr. Jean Clinton, Associate Clinical Professor, Department of Psychiatry and Behavioural Neurosciences at McMaster, who demonstrated how breastfeeding is a key factor in shaping a child’s long-term health and wellbeing. When we become pregnant, we are responsible for nurturing a tiny, separate creature, just a collection of cells. For nine months our bodies nourish and protect. At the moment of birth when we first become mothers, when we first experience the reality of “we” and let go of “me,” we are suddenly held accountable for the most significant responsibility we can possibly imagine. Growing – building – a brain. Fortunately it’s not as hard as it sounds. In fact, it’s probably one of the easier things we will do in our parenting careers. Don’t believe me? Check back in with me when your child has moved from babyhood, through the preschool years, and beyond tweens – when you’re working hard to pull off just the right finishing touches of your baby’s brain… in the face of adolescent rebellion in all its glory. Lucky for us, biology is on our side. From the moment of birth, the placenta that nourished our babies throughout our pregnancy begins to separate from our uterine wall. This unleashes a cascade of hormones coursing through our bodies. At roughly the same time, our newborns land between our breasts with some built-in behaviours. They want us. They NEED us. They can’t conceive of a universe without us. And we’re amazed to discover we can’t conceive of the universe without them, either! Anyone who has had a reasonably normal birth experience with minimal intervention will remember the first moment of connection with their newborn baby. There was touch – those of us lucky enough to have been able to feel our babies emerge from our bodies, to feel them skin-to-skin on our chests or bellies, will recall that first sensation. The very next moment is eye contact – we connect. Sometimes it is so rapid, that locking of eyes, it comes even at the moment of touch, as we scoop our babies up in our arms. A newborn’s gaze is commanding, demanding! Baby’s first latch onto the breast is an immensely significant moment, and it is part of a continuum of connections that form the very roots of attachment. The brain scientists pay lip service to all the standard explanations of why breastfeeding is important. Providing the physiologically normal nutrition for human mammals, immune factors tailored to the child’s environment, yes of course, those are important. But brain building! How amazing is that. Brain scientists explain that our brains are not just the product of our genes. Clinton and Gibb are clear. Our brains are sculpted by a lifetime of experiences, and the most important time in brain development is in the first years of life. Nature v. nurture is not a matter of debate. The research shows our environment impacts our brain, and it’s not just our brains. What happens to us can change the nature of the genes we express – we can pass on our experiences to our offspring. The way our brains grow when we are young is passed on to our children – even if we don’t parent them, they inherit our parenting characteristics. Every single thing a newborn baby experiences is contributing to building that baby’s brain. Brain scientists talk about “place-based brain building” when they talk about breastfeeding and the brain. The brain is a social organ that is wired through experience, and breastfeeding is designed to positively wire our brains to allow us to develop attachments and relationships. Breastfeeding is more than nutrition, it is brain building. Scientists are able to look at the way our brains are wired, and they can see that after an experience, the wiring is changed. Repeated experiences, positive or negative, sculpt our brains. Remember those first moments after birth, with the infant seeking eye contact and skin-to-skin facilitating touch and exploration? After a birth where there has been no interference with our senses and the baby’s senses, we connect through touch, vision, smell, sound, proprioception, and taste. These are two-way interactions – baby looks at us, we stare back. We touch baby’s hand, it curls around our fist. Infants “serve up” interaction, and when we respond, we are return that serve – it is the repeated serve and return that is building these neural pathways in our brains. A brain that is wired through positive experience—the serve and return of normal human interaction between baby and parent—is a normal brain. A brain that is neglected is an underdeveloped brain that will not have the same capacity to experience and regulate emotions, form close interpersonal relationships, and explore the environment in order to learn. An underdeveloped brain faces a lifetime of potential negative outcomes. Clinton and Gibb described the research on these lifelong impacts. In the teen years we see school failure, teen pregnancy. In the 20s and 30s we see obesity, high blood pressure, depression, which lead to heart disease and diabetes in the 40s and 50s, and in old age we face higher risk of premature aging and memory loss. What else is happening when a baby is at the breast? Research tells us a baby placed skin-to-skin in its post-uterine habitat – between a mother’s breasts – is a baby who is in a relaxed, happy state. Heart rate, temperature, breathing rate – all of these measures are stable in a healthy infant who is relaxed and happy at the breast. A baby, who is not in this stable, normal state, is experiencing stress. We can measure this through increased heart rate, an inability to regulate temperature, and abnormal breathing patterns. We know it results in a release of the stress hormone, cortisol. High levels of cortisol over time will literally kill brain cells – a hippocampus exposed to high sterol levels shows loss of dendrites and cell death. The frontal brain develops poorly, causing attention deficits. Stress over time results in chronic over or underproduction of cortisol. Over production of cortisol is linked to behavior problems – ADHD, violence – as well as health problems ranging from diabetes and malnutrition to memory problems, heart disease, immune dysfunction, and addiction. Under production of cortisol is linked to autoimmune diseases like chronic fatigue, arthritis, allergies, and asthma. A child that is securely attached through the serve and return of a repeated experience of bliss at the breast shows the ability to buffer the negative response to cortisol during stressful events. Both brain scientists talked about the importance of secure attachment to optimum brain development through childhood, and it’s clear that attachment begins at birth, with breastfeeding. What of the mother who can’t breastfeed? Our brain scientists referred to skin-to-skin expert Dr. Nils Bergman in their talk and noted his position that breastfeeding’s most important function is not nutritional, but is in brain building. Clinton points out that mothers who aren’t able to, or don’t wish to breastfeed can still use at-breast supplementers and donor milk to feed their babies at the breast, allowing the baby to experience the repeated serve-and-return of the interactions that wire brains for success.